Back in 2010, I read Return of the Native for the first time. A few comments about that. First, it was my first read of Hardy since Tess of the D’Urbervilles in 2006. I’d been scared to read more by him since he’s very pastoral and I didn’t enjoy those parts of Tess. Second, it was the first audiobook I loved and the book that caused me to fall in love with audiobooks generally. Third, my review remains my favorite ever written. It was so much fun to write! 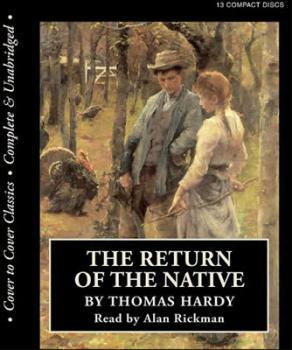 I didn’t get terribly serious in it, and now re-listening to the book after 8.5 years, I wanted to take a slightly deeper look at Return of the Native. For a funner, less-serious, and spoiler-free review, see the link above. There are six main characters in this book. Three are in the Yeobright family: Mrs. Yeobright, her son Clym, and her niece Thomasin. Then there are three others tangled up with this family: Damon Wildeve (Thomasin’s eventual husband), Eustasia Vye (Clym’s eventual wife), and Diggory Venn (the noble character who also acts as deus ex machina for the story). Each of these characters represent an archetype, and most have a tragic flaw or two as well. Pride, selfishness, stubbornness, idealism, laziness, and impulsiveness are contrasted against innocence, love, self-sacrifice, respect, duty, and realism. Most of the cast end up dead or disabled. Only those who have primarily good qualities end up happy. As I was reading this time, I found myself looking in particular at the two young women, Thomasin and Eustasia. The former is innocent and passive, the other is reckless and self-serving. As in my last reading, I wanted to feel sorry for Eustasia because she had so few choices, but it was difficult to feel pity when she used people and cast them aside so easily. She wanted everything in the world, but she wanted it handed to her and would not even think of lifting a finger to get it, even when she has the opportunity. The only thing she worked at was trying to manipulate others to her will, and that had me considering just how similar she was to Becky Sharp in Vanity Fair. Thomasin, too, was a contrast to Eustasia as Amelia was to Becky in VF. Amelia is the innocent, humble, quiet one; Becky is the manipulative, self-serving one. But in VF, both Amelia and Becky are anti-heroes, and Thackeray skewers them both mercilessly. In this book, Hardy is far more subtle. He extolls the misfortunes of Eustasia’s life that led her to be the person she is, while simultaneously making it just about impossible to pity her, and he pretty much leaves Thomasin alone. In fact, his treatment of Diggory Venn (the most Mary Sue character I’ve ever read) seems to indicate that Hardy (unlike Thackeray) approved of meekness, self-sacrifice, and duty-above-everything-else as a way of life. Another thing I noticed quite a bit was the rural idealism. Hardy was fascinated by rural life and spent a lot of time idealizing it in all his books. He is not unlike Clym that way, after Clym comes home from Paris and decides that simple, rural, (idealized) life is far better than any other way of living. Even after Clym becomes disabled and is no longer able to go through with his plans to create a school that caters to rural communities, he copes by taking to manual farm labor. Nothing wrong with that, except that in doing so, he leaves his family without money and puts his marriage into a state of extreme distress. He’s stubborn and holds onto ideals even as the reality of those ideals doesn’t match up with his beliefs. It makes me wonder if there are any parallels to Hardy’s life there, or if Hardy was able to maintain his idealism in reality as well as novels. I enjoyed revisiting Return of the Native, though I admit that on second read, it was easier to see some of the devices and heavy-handedness of the story. (I mean, come on, how many times will Diggory Venn show up at the exact right moment to rescue someone or alter the course of the story?) It was still a lovely book, though, and of course the audio read by Alan Rickman is superb. This entry was posted in 2019, Adult, Prose and tagged audio, callback, classics, favorite, memorable, reread. Bookmark the permalink. Hi Amanda: I saw your review listed on the Classics Challenge (I’m also participating) and, since I was interested in Hardy, thought I’d check it out. I read both your original & second reviews and found them very entertaining! Hardy’s one of those 19th century writers I’ve always meant to really, really read but I’ve always found him quite intimidating (as you say, the rural thing can get old). I made it through Far from the Madding Crowd (have to be honest — read it AFTER seeing the movie) and Tess (again, saw movie first!) and really liked both. At various times over the years, I thought I’d go on and do a clean sweep of the Hardy novels but — always threw in the towel after 50 pages or so (tried Return of the Native twice) I like the anti-heroine types, so Eustasia (loved Becky Sharp) so maybe I’ll not totally give up on Hardy yet! Hi! 🙂 You know, I’ve read like five of Hardy’s books now and I STILL find him intimidating. He’s one of the only classic authors I’ve found that I enjoy better on audio. Most classics don’t work for me on audio, but for some reason the audio experience helps me to get through those drier parts of Hardy without feeling dry at all. I’ve read them both on and off audio, and even when I do read, I find them worth it in the end. Jude the Obscure is one I read in print, and it was HARD getting through. And totally worth it by the climax. The audio is a great idea that I hadn’t thought of (I’m new to audio books). I can see how listening might help with some of those difficult 19th century writers (especially if the narrator is Alan Rickman — I share your passion there!). It’s nice to know that Jude is worth the slog; the next time I try it (probably not too soon, I have some Challenge books to put away first) this might be enough to keep me going!